More of this fun couple is coming soooon! This week was all about packing, panicking, driving, unpacking, coming home, leaving again and getting settled in. As I left home and prepared for the next wedding (YAY!) Mom came hurrying after me and asked, Do you have enough shoes? Three pairs will do for one day, right? Haha. So here is a new Relaxed Friday for you! We had just ordered in my favorite restaurant in Siena, the warm evening air brushed against our skin and my friend Louisa turned to me and Ela. But seriously how long do you know each other? Ahm... we stared at each other, starting to count the years in silent... really? I did not quite remember the first time we meet or talked but we came up with... mhh, something like fourteen years... whaaat? We stared at each other in disbelieve and started to giggle again. Yes for these two minutes I felt old, haha. So here you have it: my very last visit in Siena by my childhood friend Ela. We toured Siena and Rome, had our wonderful long talks and as we came across this tiny street while the good light sneaked along the streets I insisted to do a Mini- Session and catch some of the rose and orange reflection on the cobbled stone. Ela stared at me again, really Rici here? This is a good spot? But look for yourselves and enjoy the beauty!! I am very happy to have had some minutes to catch these moments with you Ela! 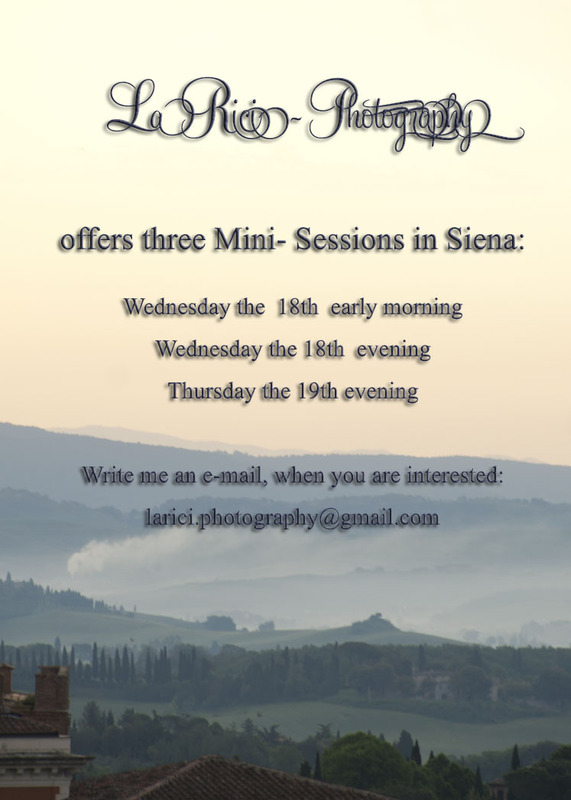 Since this is almost my last week in Siena I wanted to offer Mini-Sessions as part of my taking leave. SO what is a Mini-Session? We meet up around sunrise or sunset time, hang out for 30 minutes, you can choose outfits and location and you will receive fifteen fun pictures of you. I am open to your ideas! It can be a portrait session, a mini styled shoot, a couple session. Let me know your ideas and wishes! Noi ci incontriamo per 30 minuti, per alba oppure tramonto. Puoi scegliere vestiti e un posto a Siena che ti piace. Alla fine riceverai quindici immagini di te. Può essere una session per ritratti o per una coppia, scrivermi le tue idee. 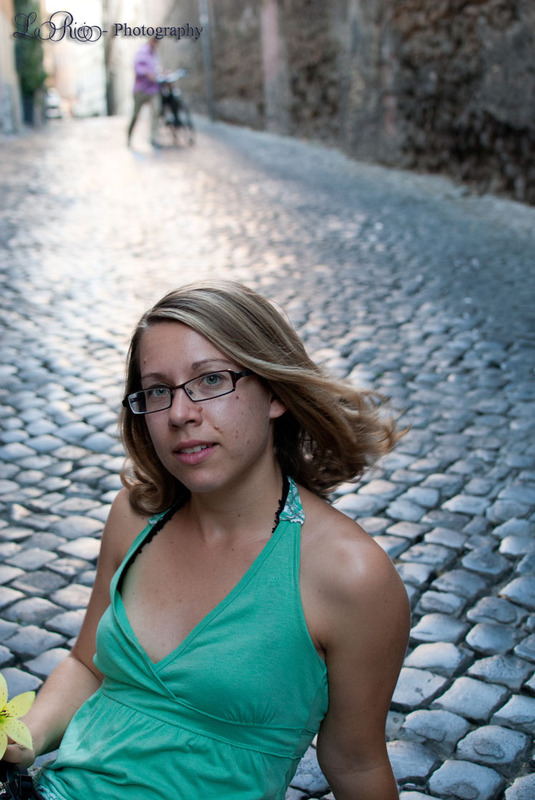 Impressions from two days in Rome. 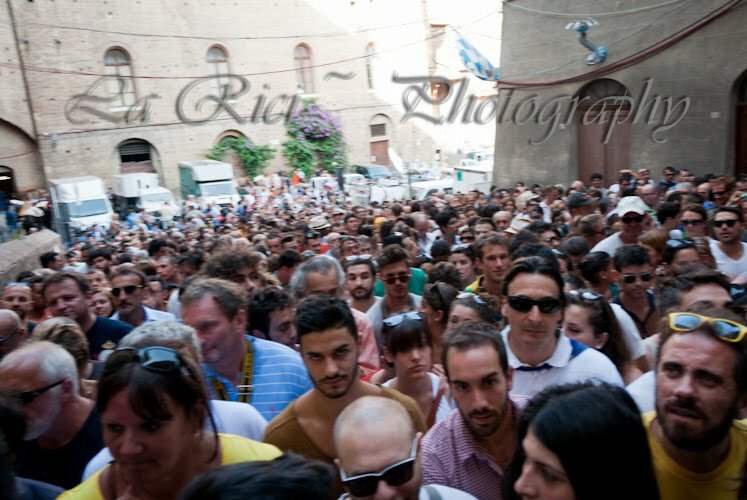 Right after the Palio (horse race) high, for me there came a low. I mean I knew it would happen one of these days. But so strong and so passionate. Oh well. For many of my friends are already done with exams, are about to depart. Home, too far away countries. And this reminds me, that my time in Tuscany, well there is an end, and it´s near. As I am a hopeless dreamer, I don´t wanna see it. I am lying to time and to days and I am standing in my favorite giardino at night, to oversee the city and I want to freeze the moment in time. But then a small thought enters my mind. There is a time to come to Tuscany and there is a time for leaving Tuscany. *My own interpretation of Ecclesiastes 3. Right now, this month, it´s time to move on and conquer new grounds. But I know in my heart: Tuscany I will be back! 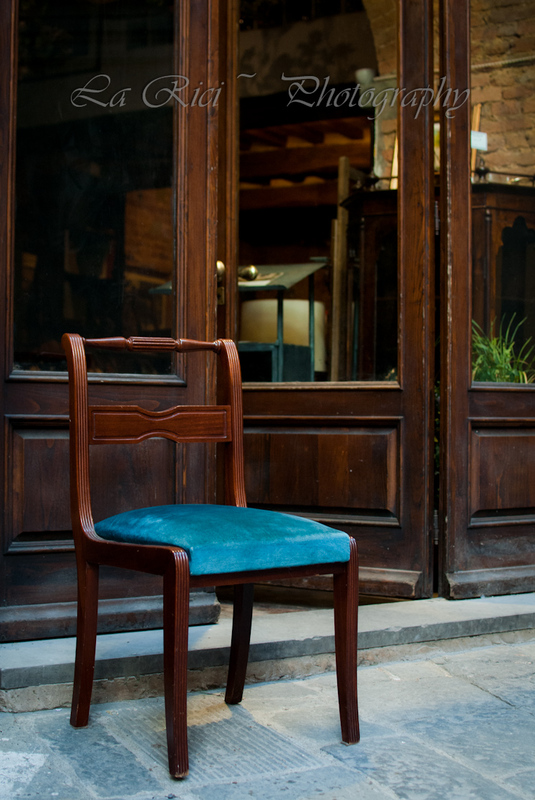 Many times I have hinted at the medieval flair still clinging to this tiny town called Siena. Besides a city wall which is dividing the outer part of the city and an inner, of course more pure, noble part of the city... besides the ancient Contrade (neighborhoods)... even some people behave medieval. As it happened to occur one night, my good friend Alex was walking home. I want to stress the walking. She was not standing under some window and making a whole lot of noise, no she was moving. And just this moment someone threw water out of the window and right on her. I could not believe my ears as she told me what just happened to her! No way! Are you freakin´ kidding me?!?! Are you still throwing water out of your windows? How many years has the pluming be installed around here?!?! NO this cannot be, however, many Sienese people don´t care about the things which cannot be. So here is the second installment of relaxed Friday. On Monday, the day was finally here. The 2nd of July. A day awaited for a whole year from all Sienese people and also from me. The Palio. Till the very day I considered not going to the actual horse race (I have been to a lot of the practice races), because let´s face it I am slightly claustrophobic and with my super low blood pressure I tend to faint standing in the sun for too long. And this is what we were about to do. We would stand in the sun with a humongous amount of people and wait. While melting away, we would count the minutes till the canon ball announced the arrival of the jockeys. This is not exactly my ideal situation to watch horse races. But then I made a decision during the midday and I gathered all my strength for the task ahead. Luckily I have some pretty awesome roomies, which know how things are done in this town. A lot of tourists waited in the full midday sun since two pm, when the race would not start till eight. So here is how we proceeded, we rested and relaxed during the day and as half past six came along we squeezed simultaneously through a tiny street, the last one still open at that time. It felt like pushing through the birth canal all over again. Via Dupré is not even broad enough for two cars to pass next to each other, but what felt like ten thousand Sienese people, they now how it´s done. Forget queuing and organization, we are in Italy! 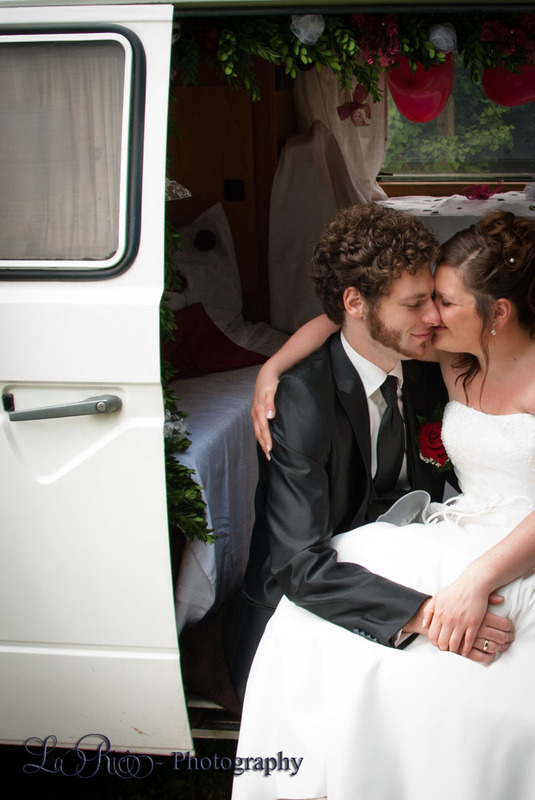 Even if till now my description of the big day sounds weird, it is a day I am sure I will tell my kids about. One day when they come into the house after running around between cherry trees and basil, when I am about to lay them down for the night and their big hungry kids eyes are glued to my face as I am about to tell the goodnight story. … I will tell of a tension I have never seen before in a crowd so passionate. 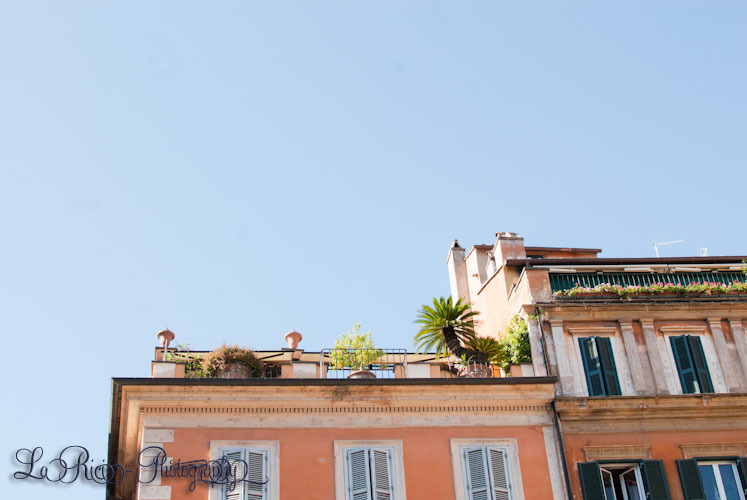 … I will tell them that the minimum 35° degree sun felt refreshing after finally arriving in the piazza. 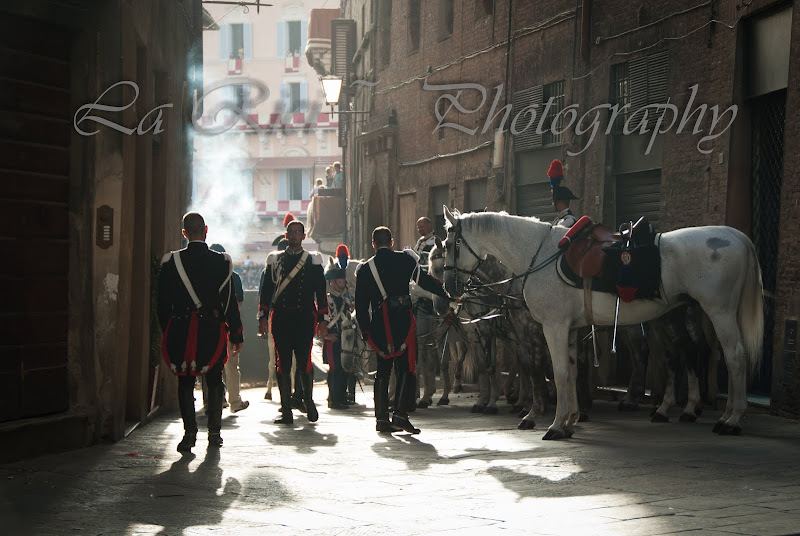 Give me Carabinieri, in uniforms designed by Armani with white noble horses … and I´m in heaven! PS, being obsorebed and swolloed up by the cities biggest event. 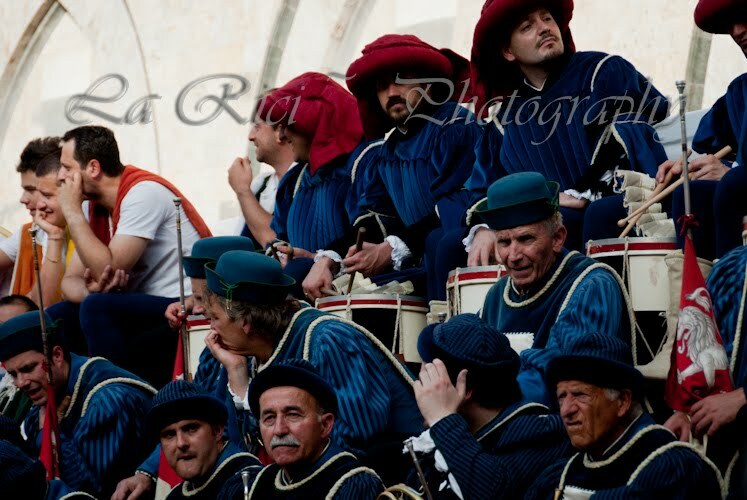 Nothing else matters on this very day… the day of the Palio.